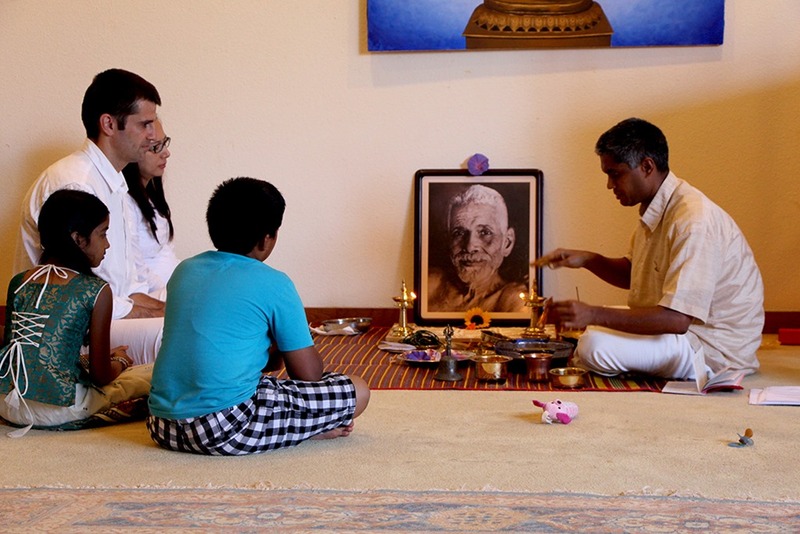 Samskaras are a series of rituals that serve as rites of passage and mark the various stages of human life. 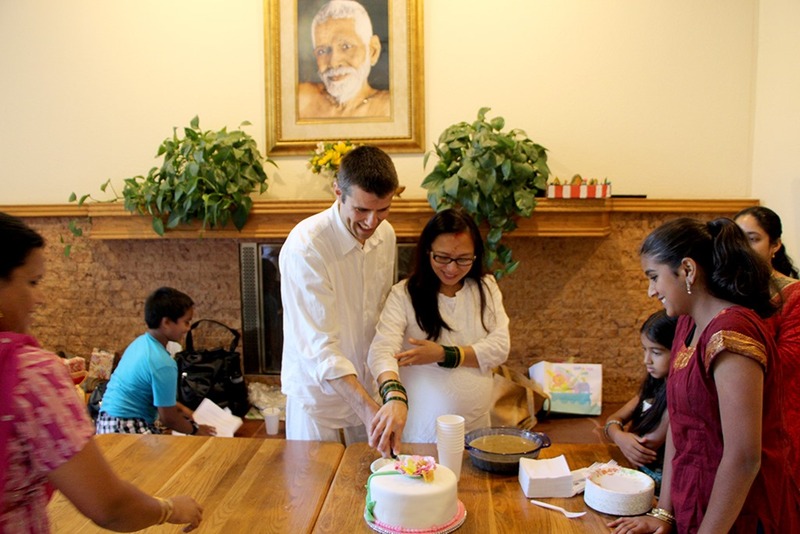 On October 19, 2014, devotees held a small ceremony for Scott and Prema and their unborn child who is due to arrive in December. The necessary implements are procured and an altar is made by Ganesh and Dhanya. The ceremony is given by Ganesh. 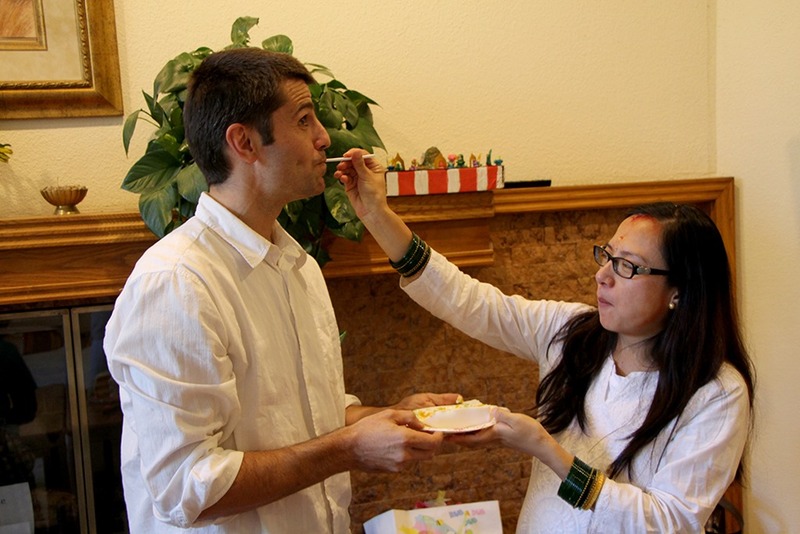 First, Scott and Prema are moved to the proper position…he is on the right and she is on the left. 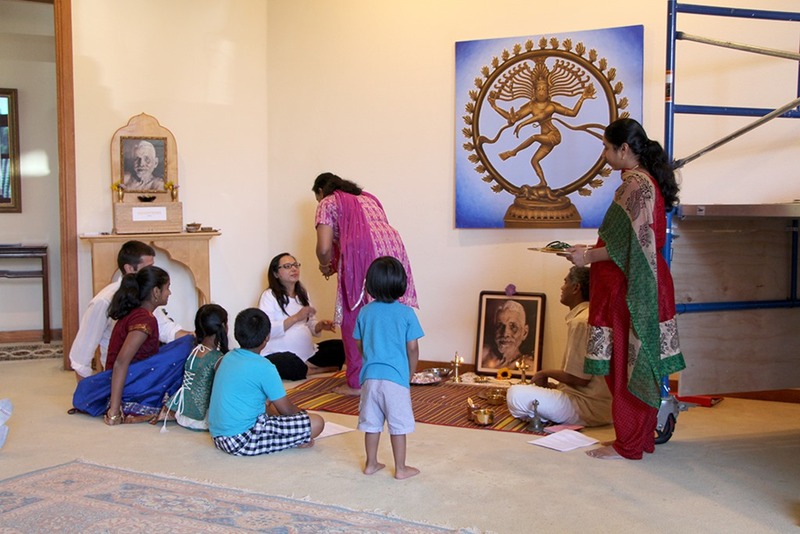 This form of samskara is typically done after the seventh month of pregnancy when the child in the womb is believed to have developed hearing capacity. 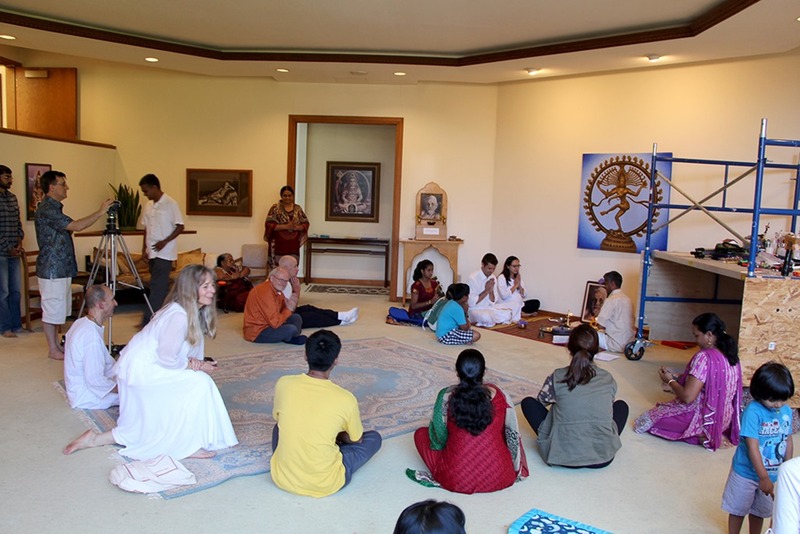 At this point the child should be hearing sattvic sounds in the form of discourses and chants from holy texts, sacred stories and songs, all of which should be recited in a holy, peaceful and joyful atmosphere. 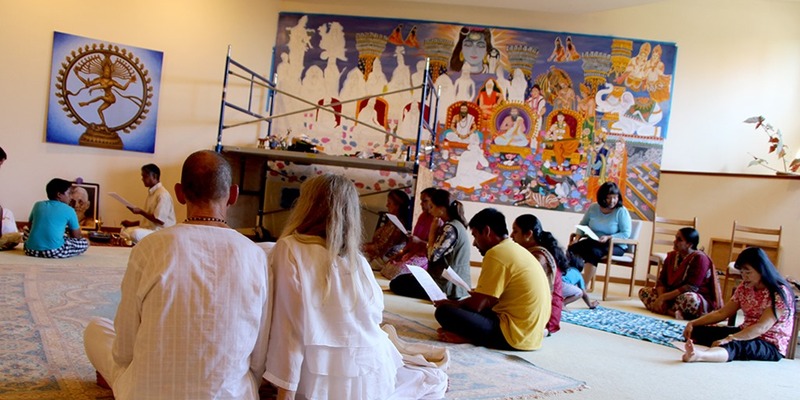 The event begins with a traditional sixteen step gaṇeśa pūja for this auspicious occasion to be obstacle-free, followed by obeisance to Guru – guru vandanaṃ (brahmanandam, apara-saccid). 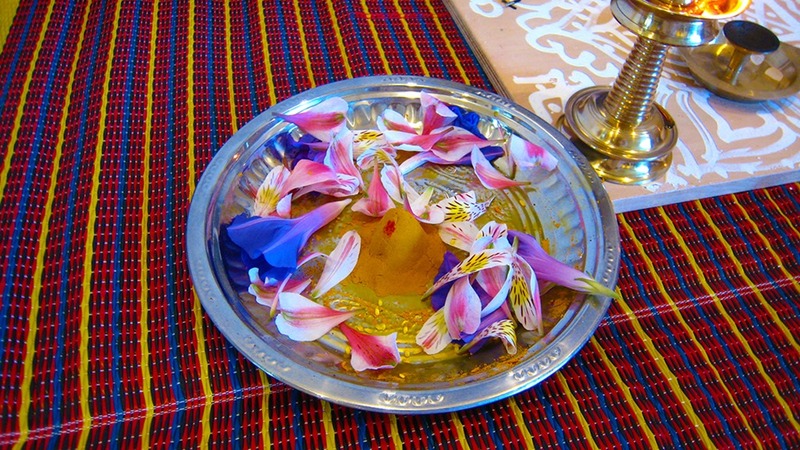 Above, the form of Sri Ganapti is made of turmeric. Once blessings are received from Sri Ganapti and the Guru, the following chants were sung for the well being and protection of the mother-to-be and her unborn child. OM, to that Goddess who protects pregnancy we know and to that auspicious Goddess, may we direct our minds (meditate). May that Goddess inspire (impel) us. O Lord Brahma, Who creates people, the lord of the people. Be pleased to accept this offering, please protect this pregnant woman along with her unborn baby, from all dangers. O Ashvini Devas (physician), the ones to be honored, be pleased to accept this offering, please protect this pregnant woman along with her unborn baby, from all dangers. O Rudras who are eleven, Please accept this offering, to make us happy, please protect this pregnant woman along with her unborn baby daily. O Sun Gods who are twelve, Please accept this offering, By increasing your luster, please protect this pregnant woman along with her unborn baby daily. O Vinayaka, the Lord of gana-s, the son of Shiva, one with great strength, Please accept this offering, please protect this pregnant woman along with her unborn baby from all dangers. O Skanda, with six heads, the Lord of gods, who increases the love for our children, Please accept this sacred offering, please protect this pregnant woman along with her unborn baby from all dangers. O Prabhasa, Prabhava, Shyama, Pratyusha, Marutha, Anala, Dhruva, Dhara Dhura, who are praised as the eight Vasus, Please accept this sacred offering, please protect this pregnant woman along with her unborn baby daily. O Goddess of forefathers, the excellent among forefathers, the one with great strength, the excellent among elements, the inward turned, the one dear to Shaunaka, Please accept this sacred offering, please protect this pregnant woman along with her unborn baby from all dangers. Please protect O great God, who blesses His devotees, O Govinda, who has bird as vehicle, please protect this pregnant woman along with her unborn baby. Following the above recitations female relatives and friends place glass bangles on the wrists of the mother-to-be (the same number of bangles are applied to each wrist). It is believed that the movement and tinkling sound of the glass bangles is good for the fetus. 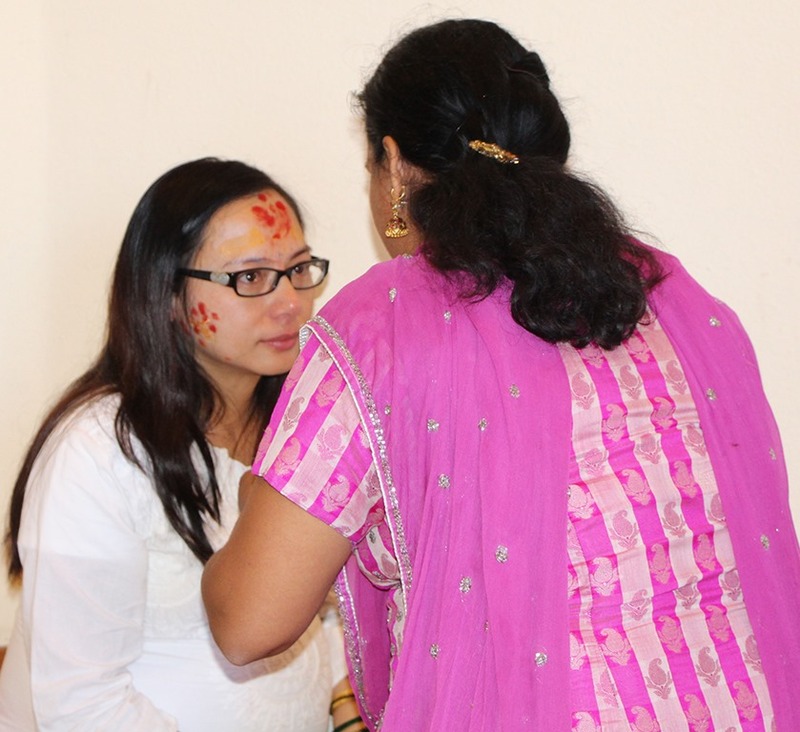 Sandal and Kumkum are also placed on the mothers cheeks. Devotees sing while each female relative or friend applies these. Above, Advait sings and all quietly listen. A brief summary of this chapter: At the auspicous time when the planets and stars were in a mutually peaceful position, the quarters were pleased, the sky filled with groups of blemishless stars, rivers flowing with clear water, deep water bodies beautiful with blooming lotuses, forests filled with sweet sound of bees and birds, wind with a soothing touch carrying sacred smell, the sacrifical fires of brahmins flaming brilliant, the mind of sadhu-s tormented by asura-s pleased, dundhubhi-s resounding in the heaven, kinnara-s gandharva-s singing happily, siddah-s and carana-s praising God happily, vidyadhara-s and apsara-s dancing together happily, gods and muni-s showering flowers happily, the clouds began to sound slowly following the sea. Like the full moon that rises in the east to destroy the darkness spread by the midnight, the essence of all the secret, the completely full Vishnu, incarnated from Devaki, of the nature of god. Seeing this wonderful child with four arms with conch, disc, club, lotus, with auspicious marks, with yellow robes and beautiful as dense water bearing clouds, Vasudeva said thus: O Lord you are known to be the real Purusa, superior to prakriti, of the nature of the experience of Bliss alone, the seer of all the intellect. Devaki seeing her son with the characteristics of a great Purusa, though afraid of Kamsa, smilingly said thus: Whose nature that is described as inconceivable, primeval, the light of Brahman, devoid of guna-s, unchangeable, composed of only Existence, without distinction, motionless, that you are, the real Visnu, the lamp of Supreme Spirit. 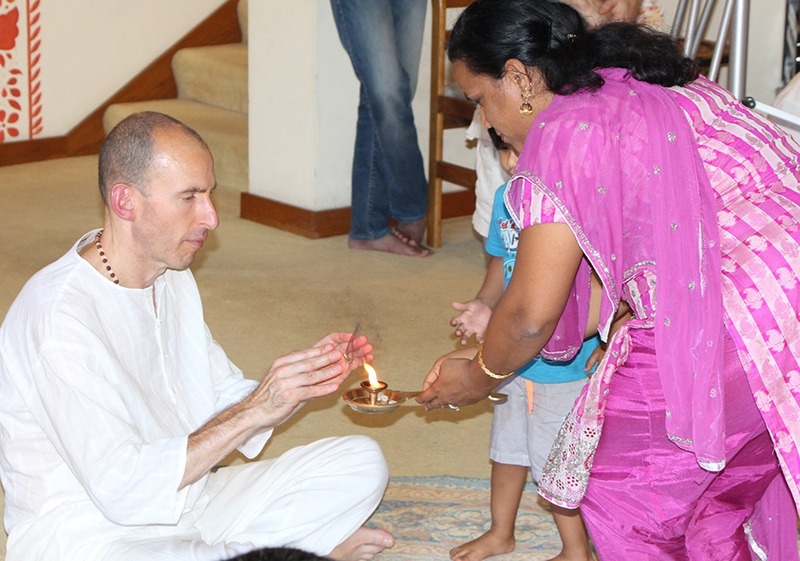 Aarti is offered and Prema, Scott, Nome and all present partake of it. After readings, songs and aarti the couple seek blessings from Nome. 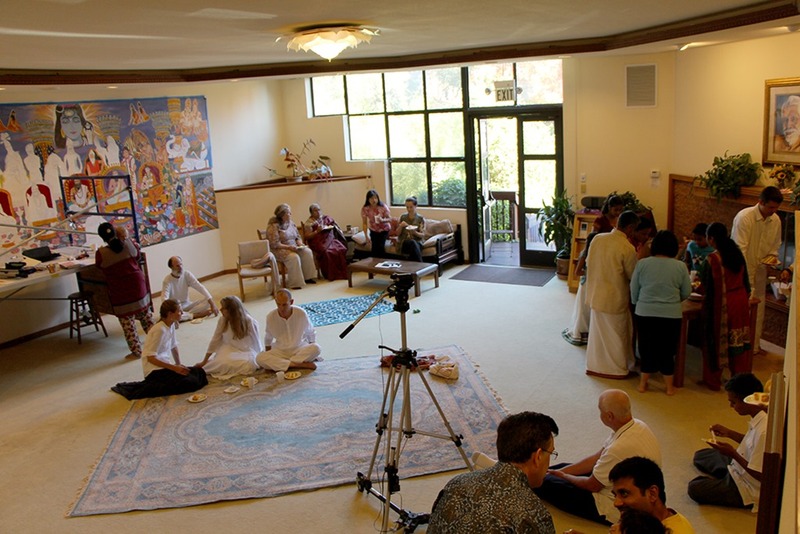 At the end of the ceremony, prasadam is served. 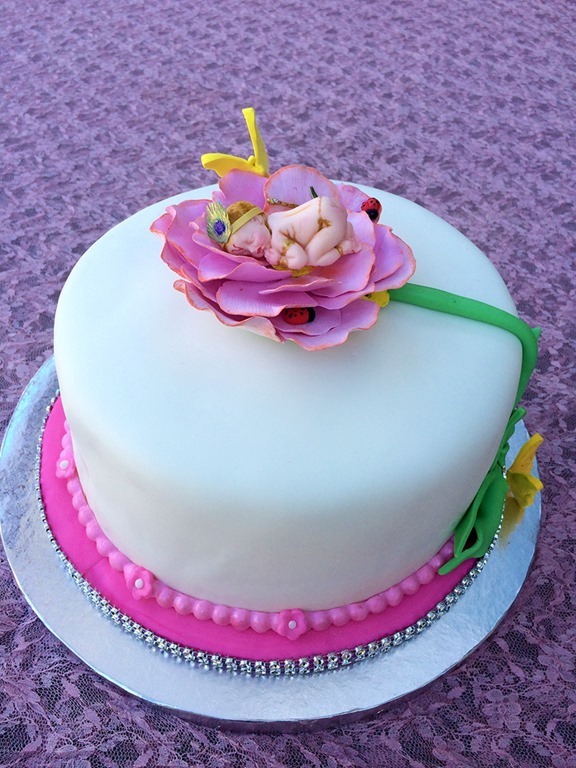 Dhanya first offers her beautiful cake to Nome. 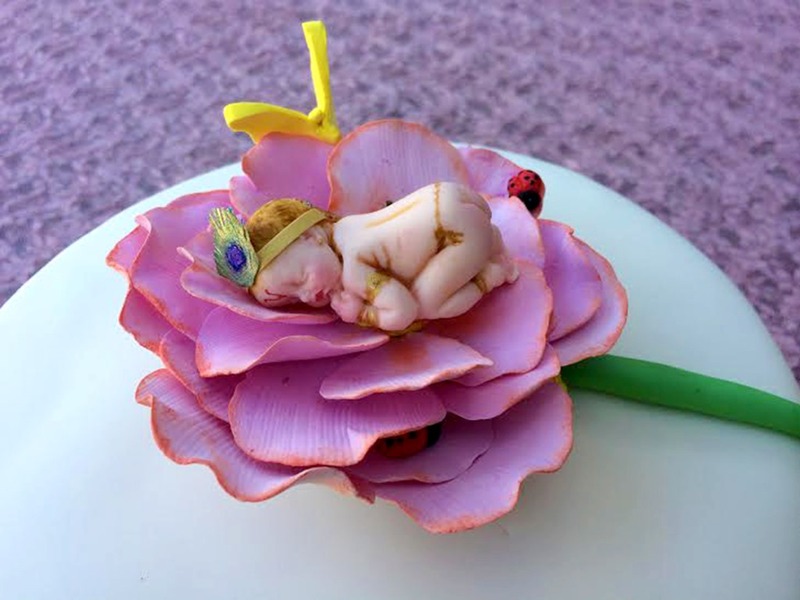 The cake displays baby Krishna resting inside of a lotus flower. 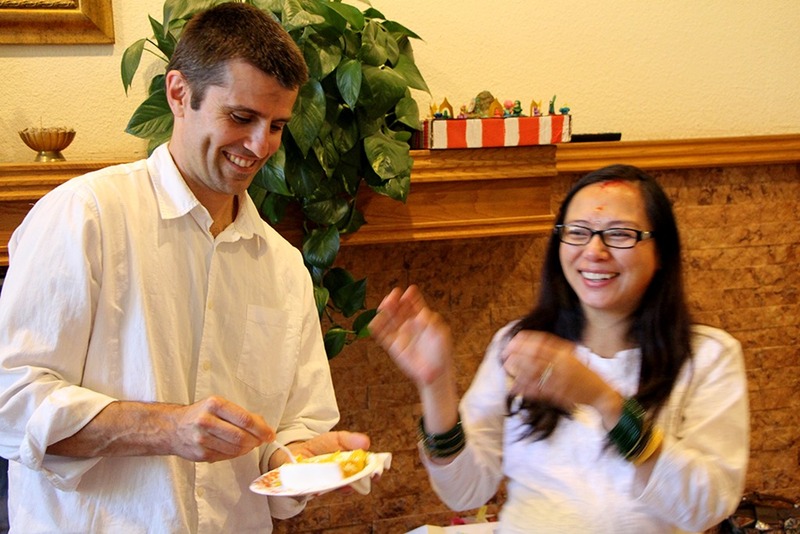 Scott and Prema cut the first slice and take turns offering mouthfuls to each other. All present partake of cake and joyfully share with one another. 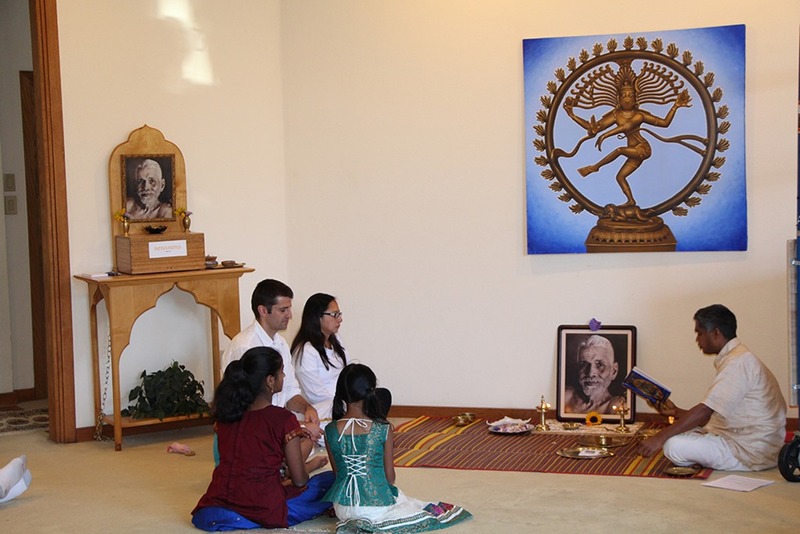 Another joyous event at the SAT Temple! 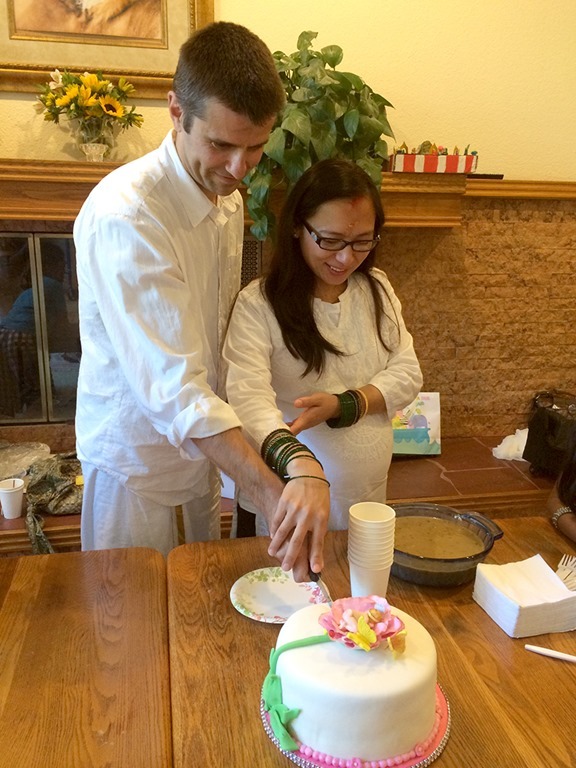 Here is a wonderful Rites of Passage ceremony for two friends from SAT, in Santa Cruz, CA. Thgis is so wonderful to see. Thank you for posting it! I appreciate that you also show the chant from the ceremony.